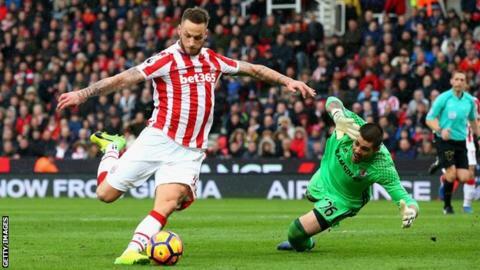 Stoke have rejected a bid from West Ham for forward Marko Arnautovic. The Press Association reports the offer was worth £20m, with the 28-year-old handing in a transfer request earlier this week. The Austria forward, who joined Stoke from Werder Bremen in 2013, is only 12 months into a four-year contract. Arnautovic scored seven times in 35 games last season and is currently with the Stoke squad in Switzerland for their pre-season training camp.